Get Free Internet Worldwide with SID! Join SID´s Internet Sharing Community for FREE to be online, more often than before! SID´s mission is "To lift as many people as possible out of poverty by means of giving the less fortunate a way to access internet for free". Today using SID is free for all Users but in future those who share their internet will get compensated by a points-value-based voucher system, which they can redeem on the SID system to obtain internet themselves from other SID Users. The less fortunate will always be able to access internet for free somehow, even in the future, by getting a voucher with certain points for consuming certain ads and use those voucher points to compensate other nearby SID Users for giving them internet access. In this way the less fortunate will not have to pay, not even one cent for their crowd sourced internet access through other nearby SID Users devices or through Wi-Fi in the SID system. - By a setting, enabling connecting automatically to the available nearby Wi-Fi Hotspots available in the SID App data base. Forget about typing passwords, just choose your settings from the menu and the app will do the rest for you. All SID user can also contribute by sharing even more Wi-Fi Hotspots with the rest of the SID community, in support of our above mission statement, by entering the password of all such Wi-Fi hotspots through the SID app, provided they are authorized to do so. - By a setting, enabling sharing your mobile data thus allowing other nearby SID User smartphones to get mobile data internet through your SID smartphone. 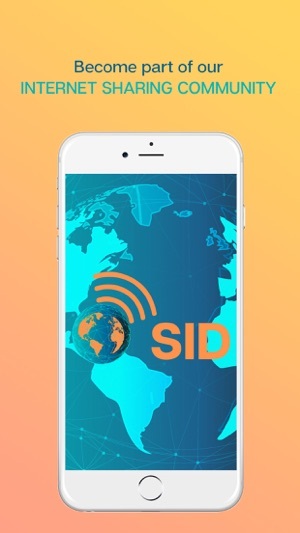 Thanks to our disruptive technology, every device connected to Internet through SID App, acts like an internet host and expands the coverage of the internet network, which results in an expanded coverage range that allows better connection to more distant SID Users. 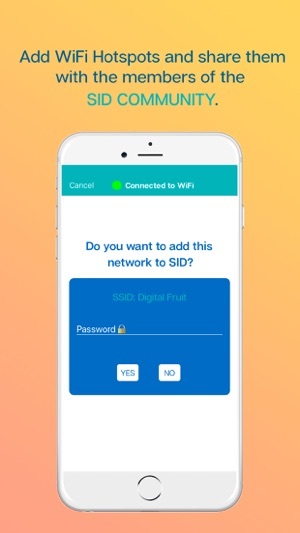 - Automatic connection: Just leave the application active in background and SID will start regularly an automatic Internet search, if the app disconnects from another SID smartphone or Wi-Fi network, it will search for another. - Disruptive technology: SID enables point-to-point and point-to-multipoint sharing of Internet between smartphones, tablets and any such other devices with the SID SDK inside. This enhances Internet access whether in a packed stadium or in a rural village, so long one device with SID inside has internet it can automatically share that internet with other SID devices. -Forget about roaming and extra data charges while you are abroad: Get free Wi-Fi in every city that you are visiting. -Spending all your mobile data before the end of the month won´t be a problem anymore, by becoming a member of the SID community, as you can get internet access from other nearby SID smartphones or tablets. 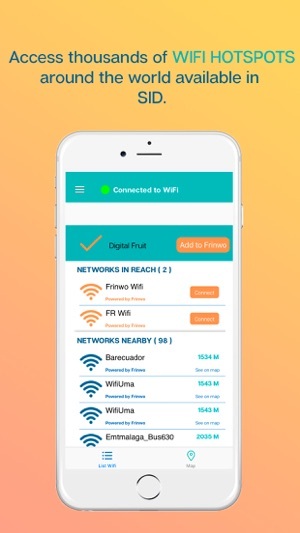 - Share Wi-Fi Hotspots with your community and expand the coverage of the free internet enabled by the SID network of User devices in your city. - Mobile data: all the mobile data shared is from your existing data plan or monthly data bundle and no other plan is needed to use the application if you decide to enable that setting BUT make sure that your SIM provider (Mobile Network, Virtual Mobile Network or ISP) terms and conditions allow for sharing mobile data with your others, similar as you would otherwise do when activating the smartphones´ tethering or personal hotspot on your smartphone. Just a fantastic app. Esy to use and connect. Works great when I go on vacation and need occasional wifi access. Also excited to be able to earn few credits by sharing my wi-fi as well. People who cannot afford expensive wi-fi will certainly benefit from this app!